Warsash Scientific presents the MP-2 microscope photometers from CRAIC Technologies. The MP-2 is an all solid state system designed for photometry of microscopic samples in many fields including biology, geology and cytophotometry. CRAIC MP-2 microscope photometers are rugged instruments designed to measure the reflectance, transmittance or fluorescence photometric values from microscopic samples rapidly and accurately. 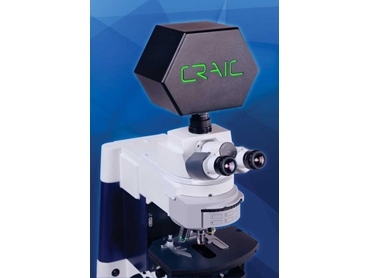 According to Dr Jumi Lee, Vice President, CRAIC Technologies, the CRAIC MP-2 microscope photometers are suitable for conducting photometric analysis of samples in diverse fields such as biology and geology. The system analyses microscopic samples by reflectance or transmittance photometry in addition to measuring emitted light. Representing the next generation of micro photometric instrumentation by delivering benefits including accuracy, speed and ease of use, the CRAIC MP-2 microscope photometers offer scientists the flexibility and sensitivity required to analyse demanding microscopic samples. The fully flexible CRAIC MP-2 microscope photometers offer a number of upgrade paths including full range spectroscopy, thermoelectric cooling to increase long term stability, ultra-high resolution imaging, advanced spectral analysis, NIST traceable standards and even full automation.